This article discusses in detail the content and context of China’s recent sentencing reform and its social, political, and criminal justice implications, as well as its limitations. The focus of China’s criminal justice reforms over the past 37 years has been predominantly on the trial process; the sentencing process has been largely neglected. Revelations of widespread sentencing inconsistency led the Supreme People’s Court (SPC) to initiate sentencing reform in 2005. The intent of the reform was to promote transparency in the sentencing process, ensure consistency in sentencing dispositions, and guard against inappropriate judicial leniency and severity via new sentencing procedural rules and guidelines limiting judges’ sentencing discretion. 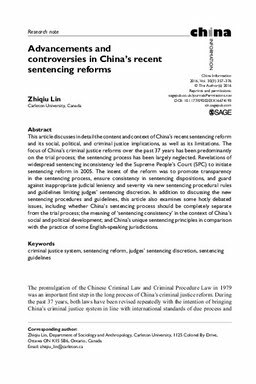 In addition to discussing the new sentencing procedures and guidelines, this article also examines some hotly debated issues, including whether China’s sentencing process should be completely separate from the trial process; the meaning of ‘sentencing consistency’ in the context of China’s social and political development; and China’s unique sentencing principles in comparison with the practice of some English-speaking jurisdictions.